Whoohoo! today is here at last, the new Stampin' Up! catalogue is out. It sparked full of lots of amazing things. On my You Tube Channel I have a flick through video and I demonstrate ho wI made the tabs I have put on my catalogue. I have done this so I can easily find what I want. I punched these out using an old scallop circle punch 7/8"
I show you in the video plus I talk you through all the suites. I do hope you have found that useful. I can't wait now to start doing tutorials with all these fabulous new sets. If you not have a catalogue then just let me know and I will send you one. 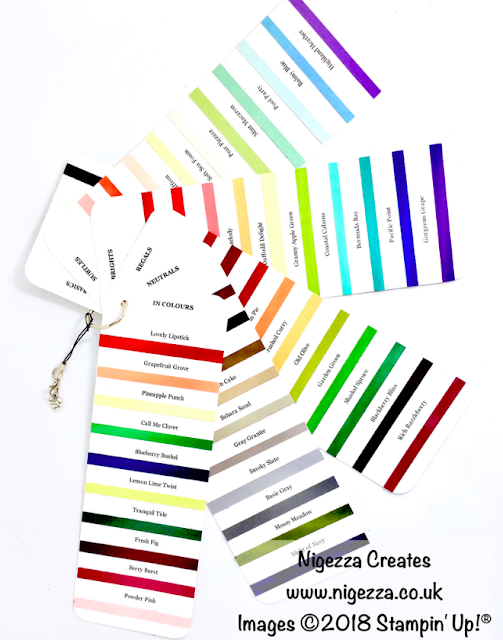 Remember that everyone ordering from me this month will get a colour swatch showing all the new colour families. All shop details are below, remember to use the June host code NNQHNSFR. Don't forget that with every order in June I am adding a colour swatch to the thank you gifts. Please use the Host code as well to ensure you get some FREE products as well.